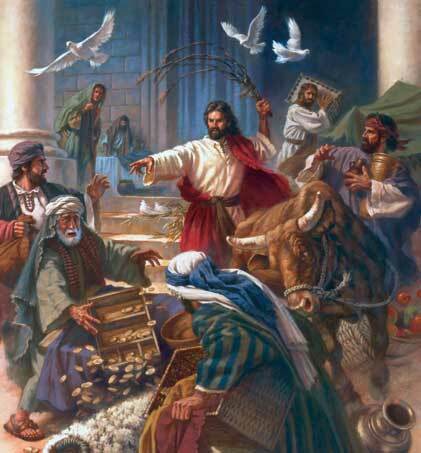 "It is written, 'My House is the house of prayer, but you have made it a den of robbers'" (Luke 19:46). The week preceding Jesus' crucifixion is one of the busiest recorded in Scripture. The reason would seem to be that Jesus knew His time was drawing near. For this reason, everything He did was for a purpose-from the riding on the donkey to the cursing of the fig tree; from the breaking of the bread to the cleansing of the temple. The Temple of Jerusalem was a major attraction for visitors. The temple was also, unfortunately, a major place of business. The merchants sanctioned by the temple abused their business privileges. They also used special temple currency which was exchanged at unfair rates. However, this was only a small part of what upset Jesus. The temple was divided into several courtyards. The outermost courtyard was the one designated for the Gentiles. They could not go any further into the temple, so that was their place for prayer. Here there was buying and selling, hordes of people talking, and animals all over the place, which made it hard to focus on fellowship with their heavenly Father. Not only that, but God was being robbed, too. Today we face a similar problem in our churches. They have become social centers where we come to catch up on the latest gossip or to be seen by the masses. And when we casually approach worship, we hinder someone else in the process. They are hurt by our gossip or they can't focus on God because of our distraction. Now let's take it the next step toward personal application. Is my body the "temple of the Holy Spirit?" Everything I do with my body, I do it to God's temple. Am I robbing Him or is my body truly a house of prayer? Dear Jesus, Come examine your temple and cleanse me of all that distracts me from You. Amen. This was taken from the Topic Notes section of the e-Sword software. Thank you for this post. I will be posting a link to your page today. This has to be shared. Thanks, again! It was convicting and encouraging to me at the same time and felt that I should share it here on the blog. I'm glad that you were blessed by it and that others will be blessed too because you've shared it with them.